Edit: They will arrive at the palace shortly. Edit: The King's guard is standing on parade (they are waiting like the rest of us). Edit: NRK talks about the future of the British monarchy and brexit. Edit: They talks to British tourists in Norway. Edit: TV2 is also back on air with royal expert Kjell Arne Totland. Edit: They arrives at the palace (the guard is playing). Maybe I missed it...but I notice that there are no bows/curtseys to either Daniel/Victoria or to Haakon and Metit-Marit? Aren't they both ranking above the Cambridges who are 'merely' heirs to the heir? Normally the royals just bow/curtsy to King and Queen. Thank ROYAL NORWAY for the information and update ! There was never going to be any bows/curtseys for the CP couples. They will do it so to the King and Queen, but we wont see that. There will now be a private tour and luncheon inside the palace. - They will come out again at 15:00 (14:00 British time) with the Queen, Princess Ingrid and the CP couple (see more information in post 38). What matters is the style rather than the ranking. The ducal couple and the Crown Princely couples all have the HRH style, so they are considered peers. Live pictures on NRK now by HM the King (my favourite guy) and the Queen, the CP couple, Princess Märtha Louise, Princess Astrid and the Cambridges in The Bird Room at the royal palace. Edit: I wrote this in post 19, and (big surprise) I was right. 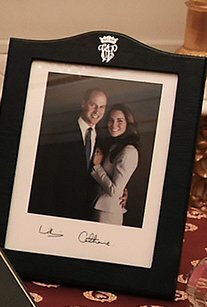 Wery pro-Diana/Cambridges, but very anti-Charles. Diana documentary on NRK2 when The Cambridges was inside the palace. Very pro-Cambridges, not anything on Charles/Diana at all. Edit: They will come out shortly. Edit: Watch the live links in post 42. Edit: The Queen, the CP couple, Princess Ingrid Alexandra and the Cambridges walks out from the palace now. The Queen and Ingrid will accompany the Cambridges on a walk in Princess Ingrid Alexandra's Sculpture Park. Edit: The Queen and Ingrid arm in arm. Edit: The Cambridges on walkabout (unusual here in Norway). Edit: The CP couple is holding hands (as usual). This has now been changed (according to TV2). - Kate will attend. Edit: TV2 are impressed by the crowds. Edit: TV2 is most interested in Ingrid (and she's really doing a good job). Edit: They are walking into the palace. Edit: They will now be heading to MESH (a co-working space for entrepreneurs and start-up companies to grow their businesses and thrive in a creative environment). Edit: They are driving out of the palace now. Edit: They arrive at the MESH. Edit: NRK and TV2 have live pictures inside the MESH, so keep watching in the live links in post 42. Edit: They are meeting the famous Norwegian chess player Magnus Carlsen. Edit: Ignorant TV2 anchor ask their UK correspondent in London why it is William and not the Queen or Charles who is coming? Because Charles is unpopular, she said. Edit: From a Charles perspective, the coverage has been ridiculous. Edit: The NRK coverage will finish now and start again at 19:30 (18:30 British time). Edit: Still live coverage on TV2 News Channel. Edit: The CP couple and the Cambridges are on their way back to the palace. They will be later King and Queen of the next generation together with Queen Victoria and King/Prince Daniel. They normally bow/curtsy only to kings and queens. HRHs are now considered equal in rank, even if one is a crown prince and the other is only the second in line to the throne. This is interesting to me, as William has always struck me as the more outgoing, extroverted of the Royal Trio (I imagine Meghan might be a bit more so, now, but time will tell.) And very charming, just a little more serious, as his role requires frequently. I've never noticed at William lacking any social skills. Anytime I've seen him in the past several years he is very relaxed and interacts well with whomever he's engaged with. It was very nice to see Ingrid Alexandra today! Lovely start of the visit. 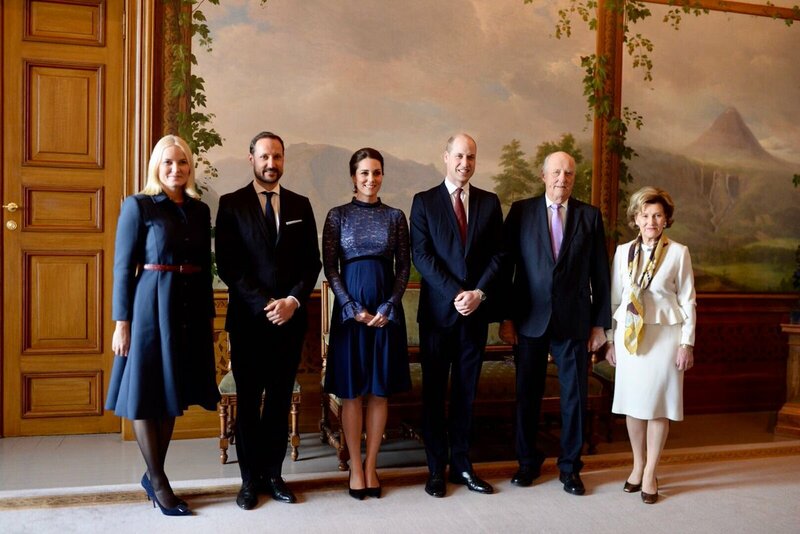 I think Mette-Marit is a bit taller than Catherine. 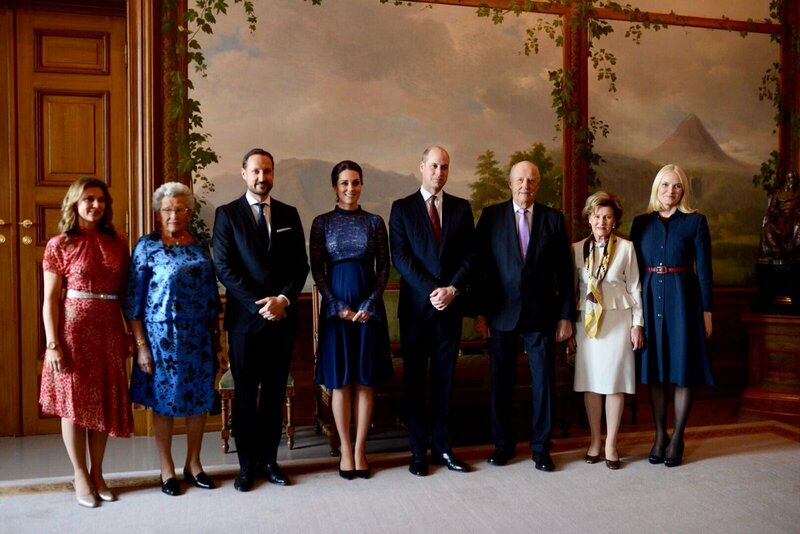 I've read somewhere that Mette-Marit is 1,80cm and Catherine is 1,77/1,78cm. It was nice that Ingrid Alexandra was there to guide them through her park. So sweet! And she is so grown up! A truly lady! Queen Sonja gave a clear message during the photography: - smile, be happy! William and Kate waved to those present when they came to the palace where they were greeted by the Norwegian royal family. It's the start of a two-day long visit to Norway for the duke and duchess. 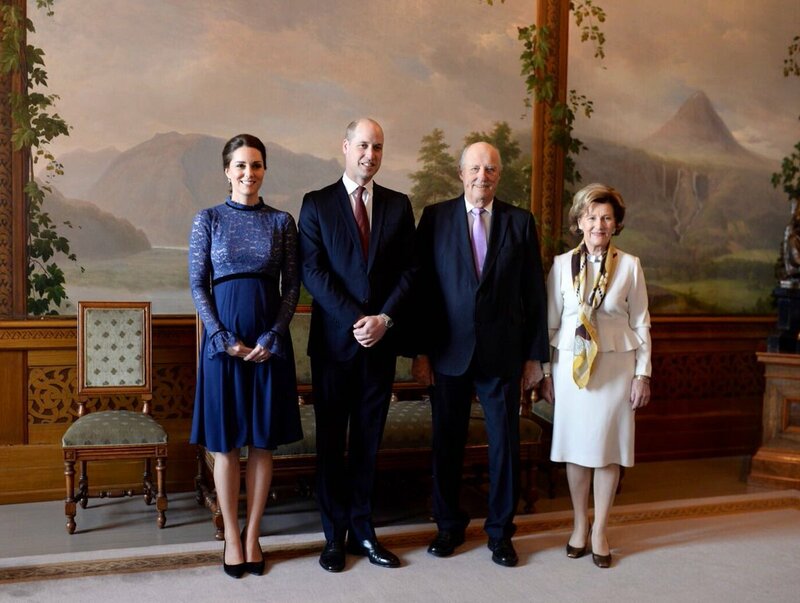 "Smile, be happy," said Queen Sonja, when they posed for official photos in the The Bird Room. A large crowd met up in the palace park to get a glimpse of William and Kate. The royal guests obviously got a good first impression of Norway. "It's amazing here," said the duchess , while William would like to go skiing. Kate looks taller tham 1,78m to me. Warm welcomes all around in Norway! Haakon and Mette Marit seem to have done a wonderful job with Ingrid Alexandra. I’ve always enjoyed seeing her participate in various events since she was small.. she’s always been cute but each time you see her she becomes more poised and today she was quite the professional young royal. Well done! Only with heels--she is not 5' 10." She usually wears 3-4 inch heels. Edit: There will be round tables in the Banqueting Hall. Edit: We are waiting for live pictures from inside palace. We are waiting for live pictures from inside the palace. Edit: We are live from the inside the palace. Edit: Watch it on TV2 (the best coverage as usual). Edit: The dinner will be attended by members of government, leaders in business and those from the Norwegian creative industries. There will also be serving members and veterans from the Norwegian Armed Forces. Edit: Politicians and culture personalities are walking through the beautiful rooms. Edit: I really look forward to the King's speech. Edit: The Prime Minister arrives.